Sales and installation of child safety products for your home and backyard. Specializing in pool safety fences by Protect-A-Child. Backyard utilization and enhancement ideas and planning consultations. 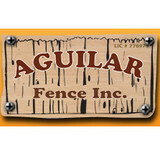 Aguilar Fence has been in business since 1997 and has grown to be a very respected fencing company. We are located in Orangevale, California. We service residential, commercial, builder, and landscape developers throughout the area. We are known for our quality and standards which are enhanced by our competitive prices. Here at Castillo Fencing, we feel that our success is a direct result of excellent customer service. We are your local fencing experts, with a strong eye for detail. Fence and deck contractor. Established in 1990. Specializing in custom high end fences, decks and remodels. With over 4000 jobs completed we pride ourselves by offering the highest quality at affordable prices. Many mistake high prices with high quality, its not true with Central valley fence Company. Our rates are fair and surprising. Custom iron gates, fences, wood fences, gates, arbors and custom work. From snake fences to any fence imaginable we will build it. We have designed many styles of fences that have become standard in the custom fence industry. We have a couple patented fence products that are used across the country daily. We are good at what we do and proud of it. We also enjoy helping people with choosing the right design regardless if we contract with them or not. We say our customers become our friends for life, and do, but even if you just need advise we offer it free. Contact us we will help. 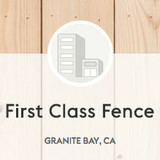 First Class Fence provides fencing services in the Granite Bay area. DK Iron has been creating decorative gates, ADA handrails, balconies, and fencing for the last ten years in the Greater Sacramento area. We're dedicated to provide a full encompassing service - whether our client's need custom iron designs, repairs, baskets, staircases, or all of the above - we do it all. We guarentee satisfaction and quality, striving to deliver something you'll take pride in. We are a family owned business and believe in the value of personal customer service. Please do not hesitate to call for an estimate. Here at K A L Fencing, we understand your interest in looking for an appropriate business to service your specific fencing needs. This is why we seek to bring about a standard of professionalism that you’ll be hard-pressed to find in any other business within our field. When you sign up for our services, we guarantee that you’ll be the saving time and energy needed in researching the other, less qualified companies. For 20 years, we’ve been providing the top quality enclosures you need to have a safe, beautiful, and secure environment for your pets and loved ones. We work as consultants to make sure our clients purchase the pool safety product that works with their lifestyle and their budget. Fences all styles, Iron, wood, vinyl, hardwood, deer, snake, horse fences. If it is a fence we will build it. Custom iron gates and operators. We believe in spaces that are designed for living, for making memories, for enjoying life. What is Lifescaping? We believe it is much more than just completing landscape projects for our customers. Rather, Lifescaping means going even further — creating usable outdoor living spaces that are as beautiful as they are functional. Spaces that are designed for living, for making memories, for enjoying life. At Lifescaping, together we help you discover what you desire for your outdoor living space. We don’t tell you what you should do with your yard; we ask you about your dreams, your ideas and your must-haves, then we work with you and for you to bring that vision to life. Whether you want to create a play area for your kids, an outdoor kitchen for hosting barbecues, a dog run, a fire pit, or all of the above, we are there every step of the way from design to completion, turning your hopes into a reality where you can enjoy creating treasured memories of good times, laughs, love, family and friends. Through our proprietary Lifescaping Outdoors consultation process, you and your personal Exterior Designer can create a custom living area just for you. Because what it all comes down to is, your home is where memories are born, nurtured and cherished. The end result is an amazing custom outdoor living space, where life is as big as you want it to be. Design it. Build It. Live it. As we proudly state in our slogan, “Revolutionizing the meaning of Service,” Fence America provides the best service and quality workmanship for your fence and gate installations to our residential and commercial customers. Fence America is located in Sacramento, CA. We are locally owned and operated since 1970. We will respond quickly with an honest estimate with no hidden fees. Fence America’s crew of talented and hard working craftsmen will provide you with top quality fences and gates, unparalleled service and will have your new fence installed quickly. Our craftsmen builders take great care not to disturb your existing landscaping and will leave your yard clean. Your Rocklin, CA fence installation and repair professional will work with you to create your ideal fence. Find a fence contractor in Rocklin, CA on Houzz. 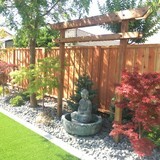 Narrow your search in the Professionals section of the website to Rocklin, CA fence contractors. You can also look through Rocklin, CA photos to find examples of fencing and gates that you like, then contact the professional who worked on them.